Artist Mariam Ghani, Daughter of Afghan Pres., Takes on US Abuse from Gitmo to Bagram to US Prisons | Democracy Now! We are on the road in Venice, Italy, the site of the Venice Biennale, the oldest and most prestigious international biennial art exhibition in the world. 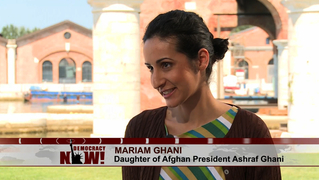 We are broadcasting from the Creative Time Summit here at the Venice Biennale, which on Tuesday featured a public discussion between Afghan President Ashraf Ghani and his daughter, the acclaimed artist Mariam Ghani, who is based in Brooklyn. She joins us to discuss how she has worked for the past decade on a number of art projects looking at how the United States responded to the Sept. 11 attacks. Along with the artist Chitra Ganesh, Ghani created an “Index of the Disappeared” — a physical archive documenting post-9/11 detentions, deportations and renditions. Ghani and Ganesh also created “The Guantanamo Effect” — an interactive digital archive defining, illustrating and linking key terms and events in the so-called global war on terror. AMY GOODMAN: We’re on the road in Venice, Italy, the site of the Venice Biennale, the oldest, most prestigious international biennial art exhibition in the world. It’s 120 years old. We’re broadcasting from the Creative Time Summit here in the Arsenale. It’s an area of Venice. Yes, the old arsenal. On Tuesday, the summit featured a public discussion between Afghan President Ashraf Ghani and his daughter, the acclaimed artist Mariam Ghani, who is based in Brooklyn, New York. Well, Mariam Ghani joins us today. For over a decade, she has worked on a number of art projects looking at how the United States responded to the September 11th attacks. Along with the artist Chitra Ganesh, Ghani created an “Index of the Disappeared,” a physical archive documenting post-9/11 detentions, deportations and renditions. Ghani and Ganesh also created “The Guantanamo Effect,” an interactive digital archive defining, illustrating and linking key terms and events in the so-called global war on terror. Mariam Ghani is also a member of Gulf Labor Working Group. Mariam, welcome to Democracy Now! It’s great to have you with us. MARIAM GHANI: It’s really my pleasure, Amy. AMY GOODMAN: It was quite a scene yesterday here. Now, everyone appears in person, but I understand that the reason your co-panelist wasn’t also here is—well, you can tell us. MARIAM GHANI: Well, it’s a bit difficult for him to come to Venice without also bringing a whole infrastructure of security personnel with him, which would have quite changed the character of the Creative Time Summit, I think. AMY GOODMAN: Well, we’re talking of course about the Afghan president, Ashraf Ghani, Mariam’s father. But your focus in talking with him at an art biennial? AMY GOODMAN: Why the president of Afghanistan and you talking about art? MARIAM GHANI: Well, as I said before—and actually we talked about this during our conversation—art is a really powerful space in which to both recover forgotten histories and to imagine possible futures, that don’t resemble the present as we know it. And I think both of those things are incredibly important to Afghanistan today. And I think Afghanistan’s artists should be encouraged to play that role and to play it to a much greater extent than they have so far. AMY GOODMAN: So let’s talk about the kind of work you’ve been involved with. I’d like to start with “The Guantanamo Effect.” Explain what you’re doing. MARIAM GHANI: Well, “Index of the Disappeared,” my collaboration with Chitra Ganesh, has been running for 11 years. And it’s both a physical archive, as you mentioned, of detentions, deportations, renditions and redactions, and also a platform for related interventions around ideas and issues that are contained in the documents that we archive. We do visual interventions, and we also organize discussions and public dialogues. We have been archiving declassified documents, first-person testimony, other artists’ projects and all kinds of other material around these issues for a long time now. And in the course of that archival project, we have acquired a lot of kind of arcane expertise in a number of different things. AMY GOODMAN: Whether we’re talking Guantánamo or Afghanistan. AMY GOODMAN: Talk about what you found. MARIAM GHANI: Yeah, “The Guantanamo Effect,” the interactive project we made for Creative Time Reports, grew out of this phenomenon that we noticed in the course of archiving for “Index of the Disappeared,” which is that both ideas, policies and personnel circulated among all the different U.S.-run prisons in the world. So, first you have U.S. corrections officers and U.S. policemen who are deployed as military, military police to Afghanistan when they’re called up in the National Guard reserves. So they end up in Abu Ghraib, they end up in Bagram, they end up in other temporary holding facilities that are prisons in forward operating bases in all of these theaters of war. AMY GOODMAN: You had, for example, Charles Graner, who ultimately went to jail, the guard at Abu Ghraib, who was known for his brutality in Pennsylvania prisons. MARIAM GHANI: Exactly, yeah. Their records were not examined before they were put in these positions with vulnerable detainees. MARIAM GHANI: You have the well-known incident at Bagram in 2002 when two detainees died, and they died specifically as a result of what are called peroneal strikes, which is a technique that’s taught to U.S. police departments to subdue prisoners who are resisting arrest. It’s a strike that’s applied with the point of the elbow. It’s supposed to be applied only to the thighs. But in the case of the prisoners at Bagram—Dilawar and Habibullah—the peroneal strikes were applied to their entire bodies, and they were applied not when the prisoners were in motion resisting arrest, but when they were actually suspended in a hanging position and left there for more than 24 hours, which caused blood clots to circulate through their bodies and led them to die of stroke. MARIAM GHANI: Mm-hmm, on false evidence, yes. AMY GOODMAN: And, I mean, how many times was his body hit? MARIAM GHANI: His body was hit over a hundred times. And this was revealed in an internal Army investigation. The MPs involved, the military police involved in the incident themselves testified in the internal Army investigation that they hit him just to hear him cry “Allah!” because they thought it was funny. So that’s why they kept hitting him. AMY GOODMAN: Repeat that, please. AMY GOODMAN: I remember the descriptions of his body, of his muscles. MARIAM GHANI: There were bruises all over his body, but especially all along his thighs and his torso. AMY GOODMAN: His muscles shredded by these beatings. MARIAM GHANI: Yeah. The internal muscles were shredded when they did the autopsy, yeah. MARIAM GHANI: It came from, yeah, a technique that was taught in U.S. police departments, although it was misapplied. It was applied in a way I don’t think it was ever intended to be applied. But it’s typical of the way that these techniques and personnel circulated into these other theaters of war and then were—I don’t want to say refined, but were transformed into something else, and then those same personnel then circulated to other theaters, so actually the same regiment of MPs who were at Bagram then were transferred to Abu Ghraib without, you know, any—this is basically before the investigation at Bagram was completed. The regiment was transferred to Abu Ghraib. And, you know, these policies, without really being examined or controlled, continue to kind of mushroom and develop. And ultimately, what happens is that the policies, the techniques, and now even the equipment, the military equipment, circulate back into the U.S., into our domestic sphere. AMY GOODMAN: What about the issue of accountability? You’re not only an Afghan woman, you’re the daughter of the president of Afghanistan. AMY GOODMAN: The issue of accountability? AMY GOODMAN: —of course, you’d be—you’re supposed to be charged with murder. MARIAM GHANI: Yes, that’s very true. And one of the problems with that kind of accountability in these military theaters of war—and “theater,” I think, is a good term to use when talking about them—is that often they’re structured by diplomatic agreements concerning the territory on which these prisons are set up. Often the prisons are taken over from prisons that were previously operated by the very regimes which the U.S. has taken—has placed the intervention to topple, to replace, and then they actually take over the same prison that was used by that previous regime, without thinking through the implications of using that kind of space and all of its ghosts, you know, which come back and haunt those halls and basically create these repetitions of the same practices. We saw this in Abu Ghraib, which was one of the prisons of the previous regime in Iraq, and we saw this in Pul-e-Charkhi in Afghanistan, which was one of the most notorious prisons of the communist regime. But the diplomatic agreements basically structure these geographical territories such that there is no accountability in the local space, in the host country, for any acts that are performed on that specifically delineated territory, because it is basically a small sovereign zone of exception to local law. AMY GOODMAN: Do you think this should be changed? MARIAM GHANI: I think it would be fantastic if it were changed. I think it’s something that will be very difficult to change in places where those agreements are already in place. But it’s certainly something that any countries that are entering into these sorts of agreements in the future should be very careful about, in terms of how they structure those agreements, because you don’t know what exactly you’re going to let yourself in for in the future. AMY GOODMAN: And then talk about what happens here in the United States. MARIAM GHANI: Yeah, so we’ve really been seeing this in the last few years, in particular. It’s become extremely visible with the recirculation of military surplus equipment from the wars in Iraq and Afghanistan into domestic police departments and even into school police departments through the MRAP program. But we saw this extremely visibly in Ferguson, in Missouri, the use of riot—riot gear that actually came from the military surplus equipment and created these extraordinarily shocking images that looked like war in a domestic space, that looked like a foreign war in a domestic space. But there are much less visible things happening, as well, especially in our prison system in the U.S. And one of the most important ones is the creation of the CMUs, or Communication Management Units, especially in Indiana and Illinois—Marion, Illinois, and Terra Haute, Indiana. So these are basically extreme exemplars of solitary confinement where not only the body is physically confined, but also all communication is diminished and managed to such an extraordinary extent that it is severely limiting to all speech. And it’s intended to limit political speech and political activism and political organizing in prison, and outside prison, as well—it’s often applied to prisoners who were activists in one way or another or who are Muslim. But what it has ended up being used for in many cases is limiting organizing in prison, as well, much the way that ad seg, administrative segregation, or traditional SHUs, solitary housing units, have been used in the California prison system, for example, with the Pelican Bay State case being one of the most significant examples of that. AMY GOODMAN: And the connection with Pelican Bay? MARIAM GHANI: Yeah, it’s actually the same lawyer at the Center for Constitutional Rights, Alexis Agathocleous, who is representing the hunger strikers at Pelican Bay State in their case against the excessive use of solitary confinement and the political use of solitary confinement, especially the use of gang classification against people who are political activists to put them into administrative segregation. And he’s also representing most of the plaintiffs in cases against the use of CMUs, both for political activists and for people who have been placed in the CMU just for being Muslim. AMY GOODMAN: I wanted to switch gears, Mariam Ghani, to talk about your work in the Gulf Labor Coalition. AMY GOODMAN: There are official posters here, you know, part of the Biennale. AMY GOODMAN: Talk about what’s happening and the activism you’re involved with as an artist. MARIAM GHANI: Well, Gulf Labor is a coalition of artists, writers, scholars, curators, architects and other cultural workers who are organizing to ensure that workers’ rights are respected in the construction of these new cultural institutions in the Gulf. And we’re particularly concentrated on Saadiyat Island in Abu Dhabi, where a new cultural zone is being constructed basically from scratch, and it’s also part of a larger real estate development project in which the arts are basically being used as one of the luxury commodities of a luxury development. And that’s one of the reasons why it’s a particular flashpoint. The other is that it’s one of those rare moments when artists have real leverage, because one of the projects is a Guggenheim in Abu Dhabi, which is an institution that collects contemporary art. And they have a mandate to collect, in this case, contemporary art from and about the Middle East region. So, we artists who are part of the producers of this work that is needed to fill this museum felt, at the moment when it was first being discussed, that we had a chance, a chance to use the museum as a kind of lever to create a wider change in the region. AMY GOODMAN: I wanted to turn right now to a quote that we got from the Guggenheim in New York, from Sarah Eaton, director of media and public relations. AMY GOODMAN: She wrote, quote, “As you know, the Guggenheim Abu Dhabi has been a central focus of the Gulf Labor group along with the Louvre and NYU AD”—that’s Abu Dhabi. “But of the three, the Guggenheim has yet to be built. The way in which the project is talked about has led to the erroneous perception that the Guggenheim is currently being built in Abu Dhabi under harsh conditions which is just not true. It is not under construction. The contractor for the construction has not [been named yet].” Eaton went on to write, “In advance of construction, the Guggenheim has been working closely on the issue with the Tourism Development and Investment Company, which is the developer of the Guggenheim Abu Dhabi. TDIC has enacted reform on several fronts, including worker accommodation, access to medical coverage, grievance procedures, and retention of passports. The Guggenheim continues to work with TDIC and other authorities and stakeholders inside and outside of the UAE to advance progress on conditions for workers who will build the future museum.” Your response to that, Mariam Ghani? MARIAM GHANI: Well, all of the infrastructure for the entire Saadiyat Island development project is basically already being constructed, so all of the water, all of the electricity, all of the foundations for the buildings are already being constructed. So it’s a bit evasive to say that no construction is being done on the Guggenheim Abu Dhabi site. They haven’t contracted the specific contractor for the Gehry design yet, perhaps—although they have put out bids, they just haven’t, you know, selected someone. AMY GOODMAN: Frank Gehry, the architect. MARIAM GHANI: Exactly, for their specific star architect building. But there is work being done on the site, so there are workers who are already working. AMY GOODMAN: And your concern about what’s happening to these workers, whether we’re talking about Guggenheim, Louvre, British Museum, Tate Museum? MARIAM GHANI: We’re concerned about all the workers in Saadiyat Island. And we’re concerned about all the workers, more generally, in the Gulf who are subjected to the kafala system. MARIAM GHANI: Which is the system whereby you are bound to a sponsor, where—who basically is in control of your right to stay in the country. And this can be especially problematic for workers who have paid a fee to a middleman recruiter to enter the country and are therefore in a debt when they arrive. They’re already in debt for several thousand dollars when they arrive, and are basically working for the first two years just to pay off that debt. So they are essentially indentured servants, their presence dependent on the grace of their kafala sponsor and the length of their visa, which is generally two years, initially, which is just long enough at current wages to pay off the middleman recruitment debt. It doesn’t seem like a very fair system, as it stands. We would like to see a real, fair working wage. We would like to see workers truly being given the right to organize. As it stands, most often, if they organize, they are deported. We’ve see this happen over and over again. And we’d like to see these practices that TDIC claims to have put in place, for example, through their EPP, their code of practices for contractors on their site—we’d like to see them actually enforced, because they exist as a code, but they’re not actually enforced. AMY GOODMAN: Are you in talks with the Guggenheim directly? MARIAM GHANI: We’re always negotiating, and we’re always open to conversations. We always say a boycott is not the end of the conversation, it’s the beginning. AMY GOODMAN: So, here your president is—your father is the president of Afghanistan. Have you considered going directly into politics? MARIAM GHANI: I prefer to work through the space of art. I think, for me, it’s more flexible, and it’s more interesting. AMY GOODMAN: Well, I thank you so much for being with us. We’re going to record a conversation with you after about your project in Ferguson, which is fascinating, the film you made about it. And we’ll post it online at democracynow.org. AMY GOODMAN: Mariam Ghani, Afghan-American artist based in Brooklyn, New York. Yes, her father is Afghan President Ashraf Ghani. On Tuesday, they took part in a public dialogue with each other here at the Creative Time Summit in Venice. Well, Mariam was here in Venice. President Ghani participated by video stream from Afghanistan. This is Democracy Now! When we come back, well, Secretary of State John Kerry is headed to Cuba to raise the flag on the U.S. Embassy in Cuba Friday. We’ll see what a local artist did to break the trade embargo—well, at least to challenge it. Stay with us.